Daniel Tamene, our Programme Finance Manager, recently travelled to the Democratic Republic of Congo to visit our partner Centre Resolution Conflits (CRC). He accompanied CRC into the bush to see first-hand the negotiation process they manage every time they rescue and resettle child soldiers. Here is Daniel’s exclusive report from the field. General Baraka is 17. He wears torn leafy green trousers and a red shirt. His reddish eyes make him look as though he has been crying all his life. He is the son of the late General of the Mai Mai, a rebel militia group operating in the Democratic Republic of Congo. Baraka was born in the bush and tries to live up to his father’s reputation. A task that should not be left to a 17 year old boy. He claims the March 2009 Peace Agreement – that was meant to end an armed rebellion in DR Congo – took his father’s life. General Baraka despises the parties involved – including the government and the UN. Barely an adult himself, General Baraka commands an army of child soldiers. He talks proudly of them, as though they are his children: I have 350 soldiers. I can give them guns and make them fight. It is a legacy of my father to command. I intend to fulfil his legacy. It is in this difficult and complex situation that we work to rescue and return child soldiers from the bush and ensure they have viable alternatives to a life of violence. On this journey, a group of six people all packed into one land cruiser car, drove across the equator southwards from Beni in North Kivu through Butembo to Musienene where we found a small village – our destination. We were invited into the house of one volunteer community member where we began our meeting with General Baraka. He turned his face to me and started inspecting my appearance, then looked back at CRC’s Project Manager and said, “I have no problem talking to people, but I am tired of NGO’s coming with promises that they never keep.” My colleague explained that many large NGO’s contact the leaders to negotiate the release of child soldiers. Many are unsuccessful in their attempts because they cannot provide alternatives to ensure the ex-child soldiers stay out of the bush. This is where CRC are different – and somewhat unique. 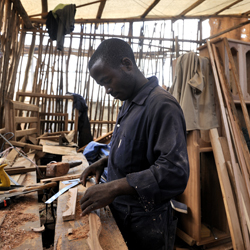 They use an approach which ensures that every soldier they release receives skills training in a trade such as carpentry, mechanics or tailoring. They work with the ex-soldiers and communities to plan how they will be accepted back into their communities. This comprehensive approach means CRC must work with smaller numbers than large international aid agencies – as often we do not have the funding to resettle more than 25 child soldiers at one time. I made no promise to the General. Nor am I in any position to do so. If anything, I am very careful about making promises that could leave our partner in a difficult position. Throughout the negotiation the General talks loudly and fast, mostly to himself although he knows full well he has my attention. He speaks of his father, his power, the need to live up to his reputation. He is a difficult character but I felt sympathy. He is too attached to his father, and there is a palpable void left by his absence. My colleague did not seem to want to disturb the pace. He smiled. He always smiles at challenges and I respected him more and more for his astute diplomacy with the resistance leaders. 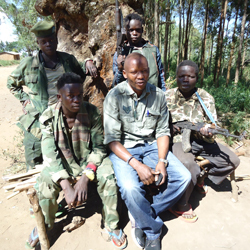 He stated: “You should show good faith, you know that we have taken care of the previous ones.” Over the past year, we have worked with CRC to release and resettle more than 100 child soldiers – no easy task for a small organisation. I didn’t think we would reach this level on this day. But I also knew that we did not have funds to resettle so many children at this stage. I looked at my colleague in charge of the reintegration project. This was bad, we needed their guns – they must be taken out of circulation. Collecting and destroying guns will reduce the desire of ex-combatants for weapons which is a common reason for them relapsing to violence. The success of DDR [Disarmament, Demobilisation & Reintegration] also rests on a soldier’s gun being taken out of supply. Otherwise, there is always extra gun waiting for someone else to pick up. I wondered if he was asking for the impossible or if he actually cared? Bringing ex-child soldiers back into the bush is neither wise nor possible. At that stage, we would have been able to take in 25 children, but not 100. If funding permits, we can find 25 host families for the children and ensure they all receive skills training or are supported to return to school. For 100 children at once, we would need more resources. I learned many lessons from experiencing this negotiation first-hand. I saw the determination and courage of my colleagues who go into the bush every week to manage negotiations like this. I learned how difficult it is to deal with militia leaders in the bush, and that negotiations take time and patience. And I truly appreciated just how important CRC’s approach to rescuing and resettling child soldiers is. The ability to turn lives around and provide alternatives to a life of violence is a powerful skill. Two weeks after this negotiation we managed to get 17 children released and returned to their communities, into skills training and back with families. This is what success looks like in the jungles of DR Congo. The work of one small yet highly effective organisation taking the initiative to both rescue child soldiers and create healthy communities that can embrace a child once trained to be a soldier, and support them to become a productive member of the community. 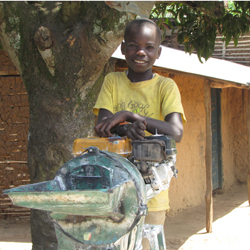 To scale up this work would be to help so many more child soldiers and their communities to overcome violence. This is what I continue to work for.